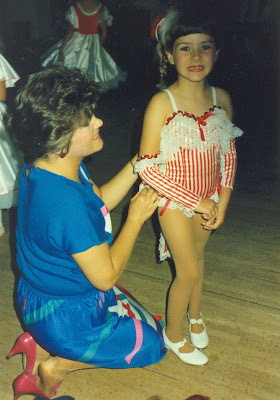 This is one of my first Dance Recitals…..
About a year ago my fiance and I started formulating a plan….. I call it our 10 year plan, but we really have no time limit set. Our plan is to open our own Dance/Music/Theatre studio for children(and adults) with a yarn store/coffee shop/performance space attached. Now… I know this is a gigantic plan. BUT, I really think we can make it happen! 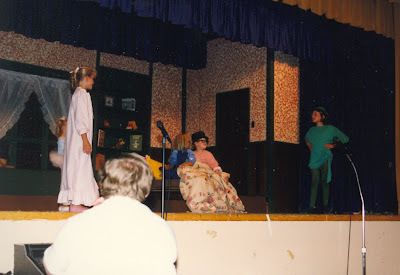 When I was a kid, I went to a musical theatre studio called The Music Room School of Performing Arts. My Mom always called it “The Church of the Music Room”, because it was such a great source of positivity and happiness as we were growing up. There were no religious affiliations, it just kept us happy and kept us out of trouble. The studio had two large dance rooms, a few smaller piano rooms, and a lobby with a few chairs. Many of the parents would sit in the lobby while we were in class, but there wasn’t much there to keep them busy. Other parents would hang in their cars, in the parking lot. How great would it have been if the parents could have been sitting in a LYS, taking their own class next door! Crocheting, Knitting or Felting while your children hone their craft! What’s better than spreading more love of art, and craftiness? Food and drink while you work on what you love (or while you do homework). We want to have a cafe with sandwiches, salads, juice, smoothies, tea and fresh roasted coffee. When I was a student at The Music Room, the studio shared a parking lot with a Carl’s Junior. Somehow, we ended up spending most of our homework time between classes at this fast food joint. They had a salad bar, and the employees were all very nice. But, I can’t help but thinking how nice it’d be to have had a little cafe next door that was run by the fantastic couple who owned The Music Room (Sharon and Lee Westenhoffer). And… how about a more “grown-up” cafe/wine/cheese bar at night. In our wildest dreams of this complex, we see a small performance space. How great to have a venue for our friends (and students) to share their music. I’d love to teach our students how to put together their own songs, sets, or even full evenings of music. In addition to taking many classes at The Music Room, I started teaching there when I was 16. I continued to teach there all the way through college. I so clearly remember the day I finally confessed that I just couldn’t manage to continue teaching while pursuing my own career as a performer. Boy… was that convo filled with a lot of tears. I loved teaching and, while I feel so lucky to be a WORKING ACTRESS, I know I want to teach again someday. My fiance also has several years of teaching experience. He worked with an AMAZING nonprofit called First Stage Children’s Theatre, and the Milwaukee Youth Symphony Orchestra. I could go on and on about those studios, but I’ll save that for a later post. I am so grateful for the millions of hours I spent at The Music Room. It provided a fantastic foundation for a fearless imagination and a place to work on my craft in a supportive, loving environment. I’m even more excited about the idea of providing future generations with a similar playground. Yay for The Music Room. It was such an amazing studio and we all had the best time there. That photo of your Mom is awesome! Hope you are well! Ash…. I adore you more! Beth… I need to put up the pic I took with your mom when we ran into her at the yarn shop in Laguna Woods! We DID have the best time there… right? Lee Westenhofer was my best friend in high school. I have lost touch with him and Sharon. Can you tell me anything more about their lives and the Music Room? It sounds as if they gave you a lot of inspiration. I know Lee was a top rate Baritone Horn player. Oh, he also played string bass. Well, thanks again for your blog and sharing your experience.